OurEnergyPolicy.org | Can Small Modular Reactors Save Nuclear Power? Given the slow and somewhat painful shutdowns of perfectly good operating nuclear plants due to competitive pressures from low priced natural gas and subsidized solar and wind generation, is there a future for new nuclear power plants? The recent experience of cost overruns and schedule delays associated with the 4 large (1200 Mwe) nuclear plants being built now in Georgia and South Carolina is not reassuring. Actually, the two in South Carolina have been essentially cancelled by the owners due to these cost overruns and lack of electricity demand. While natural gas is cleaner than coal from an emissions standpoint, nuclear energy does not emit any CO2 or other noxious gases. As we seek to reduce these emissions, nuclear energy as a baseload source of electricity is needed. Until massive new storage technology is invented and deployed, there is no other clean energy alternative available on a 24 hour, 365 day basis. So what can we do? 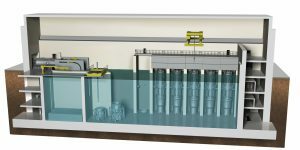 Small modular reactors (SMR) are now being designed and licensed in the US which could address some of the fundamental problems of large nuclear plants. These problems include the huge capital investment required for new plants as well offloading large increments of power all at once (1200 Mwe) during a period of slow demand growth. The improved inherent safety design of SMR’s however create cost reduction opportunities without compromising safety. Additionally, due to the small size of SMR’s, they can be modularized allowing for faster construction. These SMRS can also be built to meet electricity demand in increments typically needed. Despite all these advantages, the problem with these SMRs is the cost of power is higher than that of a large light water reactor due to their small size. Should these plants enter the market however, the speed of construction and factory manufacture of modules could make the plants competitive due to the economy of mass production. The tough part is getting enough early orders to get the mass production going. If we are going to have a cleaner more reliable energy future, small modular reactors are one hope of doing so. In order to cost effectively deploy these SMRs, regulatory changes in staffing, security, and design requirements are needed that recognize the safety these plants provide. 1) Are small modular reactors a viable solution for the future of nuclear power? 2) If states altered renewable portfolio standards designating nuclear as a qualifying clean energy source, would that be a relevant signal for investors improving the economics of these plants? 3) Should regulatory licensing policies adjust to the design of small modular reactors allowing for more efficient licensing process? 12 Responses to Can Small Modular Reactors Save Nuclear Power? Dr. Kadak, thank you for bringing these questions up for discussion. The quick response to your three points would be yes, yes, and yes. I think it’s important to note that the potential for mass production that is both economical and rapid will most easily be realized by reactors that operate at or near atmospheric pressure. This also adds inherent safety benefits, of course. The two classes of reactors that come to mind are molten salt reactors and sodium fast reactors, both of which are either already being built (Russia, China and India are all building fast reactors, albeit not SMRs) or are near to being built (several MSR designs are being incubated in various startups, based on the Oak Ridge MSR). China, of course, has a major MSR R&D effort going on, though I believe others will beat them to market unless they accelerate their schedule. The ARC-100, based on the Integral Fast Reactor, is a good example of a mass-producible SMR fast reactor that could see commercial deployment quite soon. As for molten salt designs, Thorcon is likely the first that will actually get them up and running, with a design tailor-made for rapid and inexpensive deployment at a very large scale. Regarding your point 2: Transforming renewable portfolio standards (which exclude nuclear) into clean energy standards could have a tremendously positive effect on nuclear in the USA, and it’s past time to recognize the true GHG benefits of nuclear power. This is difficult in the constant barrage of disinformation by ill-informed or disingenuous renewables advocates who claim that nuclear’s lifecycle emissions are high (absolutely untrue, especially considering that most of the claimed emissions come from enrichment powered by fossil fuel energy, which could of course come from nuclear power plants). Another factor hampering nuclear is state policies that reward utility companies for building new gas power plants even if it means shutting down perfectly good nuclear plants, like Diablo Canyon. Finally, regarding point 3: The USA’s regulatory system has gotten turned completely on its head since the early days of design development, when national labs would design and build new types of reactors without interference, then work with utility companies to license and build them commercially. Nowadays the reactor has to be designed and approved without being able to build a prototype, which is ridiculous. And the NRC costs, borne by the designer, is crippling. GE-Hitachi had to spend about a billion dollars just for an evolutionary improvement in light-water reactor design (for their ESBWR). Much of this unworkable situation has been caused by regulatory ratcheting exacerbated and encouraged by anti-nuclear ideologues and their associations. Until we can go back to a “test-then-license” system instead of today’s “license-then-test”, I’m afraid that transformative reactor designs will be built and commercialized in other countries first, where logic is more prevalent in the regulatory arena. We see it already with several companies that originated in the USA but have gone abroad to escape the dead-end system currently in place. I’ve written at length about this regulatory dilemma here. 1) It’s expensive. Renewable energy prices are dropping to the $0.02/kWh range. The falling price of storage, demand response, dispatchable renewables, and other technologies make renewables viable for almost all of our future energy needs. While modular reactors may be less expensive than current nuclear plants, they will still be significantly more expensive than renewables. 2) The waste products require very long-term management. We haven’t yet figured out how to deal with nuclear waste that, in some cases, requires hundreds to thousands of years of sequestration. With climate change upon us, stable governments who can manage nuclear waste may not be around in another 50 or 100 years. 3) Nuclear does like to be ramped up and down quickly. This is why some nuclear plants in Europe need to pay to put electricity on the grid during peak renewable generation times. While modular reactors may be a bit better at this, they still won’t be paid much (or at all) during peak periods and that will make their off-peak rates more expensive since most of the cost of a nuclear plant is “Capex” and not “Opex”. 4) Perhaps most important of all, the public has an irrational fear of nuclear power and all the data in the world won’t change that. Again, small modular reactors may change that impression somewhat, but it will be an uphill battle to put one in someone’s neighborhood. 1) You speak as if you can compare renewables and nuclear on an even footing, yet nuclear is available 24/7 and renewables are definitely not. Not even close. So if you’re going to talk about comparing costs, you have to add in the cost of “backup” (which actually provides about 70-90% of the power in most cases), including storage (far from utility-scale in the foreseeable future), gas-fired plants (which, of course, emit tons of CO2), or whatever else you envision for backup (in Germany it’s often dirty lignite). New SMRs should be easily able to meet or beat the costs of renewables once those substantial ancillary costs are honestly added into the equation. 2) A commercial-scale nuclear fuel recycling plant has already been designed by Argonne National Laboratory that can recycle spent fuel from both current (LWR) and future (MSR and fast-neutron) reactors, whether metal, oxide, or molten salt. The system has been well-proven already in the recycling of tens of thousands of fuel pins during the IFR project in the Nineties. It’s not waste, it’s fuel for new reactors. The radiotoxicity of the actual waste fission products is a matter of a few hundred years in inert forms that can be buried just about anywhere. 3) France has had their nuclear plants ramping up and down with demand for decades, and they’re older and less responsive than the new reactors will be. If you’re concerned about load following, why laud the least reliable, most intermittent and fickle energy systems as if they’re superior? The very reason load-following is presented as such an issue is precisely because wind and solar sources are so irregular. 4) Herschel has responded to this last point quite succinctly. Tom: Thanks for your reply. Believe it or not, I am not anti-nuclear. I believe nuclear plants are 1000 safer than coal plants and that fossil fuels are the most expensive thing we could imagine burning for energy (when all costs are included). If we put a real price on carbon, then nuclear would be a viable form of energy generation… if the public and policymakers allow it. I’m pointing out the problems that nuclear is facing now. It’s obviously not doing well in it’s competition with fossil fuels and renewables. 1) Agreed that nuclear is “baseload” but there are many ways to address the intermittency of renewables without nuclear. Nuclear could compete to be part of the solution. Again, if fossil fuels are priced correctly, nuclear looks more competitive, but storage, demand response, etc. will give nuclear a run for its money in the timeframe when these SMR will be deployed. 2) I do think we could deal with nuclear waste, its just that we haven’t found the political will (in the US) to do so for decades (and, likewise, we haven’t found the will to tackle climate change… which is much more serious). I am still concerned that nuclear plants need to be properly handled during operations and at end-of-life and that our climate change future may not be compatible with that. 3) I will give you that nuclear could be run in an efficient manner even if the current situation is not favorable to nuclear. Nuclear plants could be used to run CO2 to fuels plants when excess energy is available, for instance (just like excess renewables could). 4) I believe the irrational fear issue is tougher than you think. Climate change is much more dangerous than nuclear even if we were to have a Fukushima every once in a while. We know about the dangers of climate change yet we continue to not act on it even though solutions like pricing carbon will create jobs and grow the economy. We aren’t even talking seriously about policies that will address the issue. The goal of the Paris Accord is to keep warming to +2ºC (which is not a safe level), yet the policies of the Paris Accord lead to warming of about 3.7ºC (or more) around 2100, which is probably Game Over for society. That’s irrational, yet we continue down the path. Thanks for that reply, Dan. I really think these issues will be settled only when we get a truly advanced reactor design up and running. Fortunately that will likely happen within a decade and I strongly suspect it will within the next five years (albeit not in the USA). But once such a reactor is proven at full scale, if it’s as economical as predicted it’ll break the logjam and will then be rolled out quickly and in large numbers. As long as it’s safe (and you can expect it will be better than any systems now in service), utility companies will buy/build them, no matter how many protestors are out on the sidewalk. The economics will drive or sink the new reactors, and public acceptance will follow when it becomes clear that the safety and waste issues are solved. Climate change politics will be an enabling force as well. And as you said, when extra power is available (from whatever clean energy source), systems can be in place to use it for environmentally productive ends: desalination, hydrogen production, ammonia production, CO2 extraction, liquid fuel synthesis, etc. The goal should be energy abundance without fossil fuels, and that goal can certainly be achieved. Tom: We are quickly heading to $0.02/kWh for renewable electricity (without storage) and it may be $0.01 in 10 years when you say these SMRs may be available. What is the expected cost of electricity from the SMRs you are describing? Dan, for some reason there was no reply button on your last post asking about the price. It could be down around 2¢, but again you’re comparing apples and oranges. Even if RE kilowatt-hours are free, they still aren’t there when you need them. And utility-scale storage is still a pipe dream. The amount of storage needed boggles the mind, and would cost unbelievable amounts of money and vast amounts of materials and space. The basic question is one of energy density. With RE, you’re tapping some of the most diffuse (and sporadic) energy sources and trying to bend that energy to your will and schedule. With nuclear you’re taking almost unimaginable energy density that’s constantly available. You can’t just compare the price of a kWh produced with either one as if you’re comparing an equivalent product. And let’s not forget the far greater amount of materials per megawatt that RE requires compared to nuclear. Ultimately I think we can both agree that we have to replace fossil fuels with zero-carbon energy systems, right? If so, since hydro is limited, nuclear is the logical “backup” source. We can certainly produce sufficient nuclear to meet 100% of peak grid demand to cover (especially seasonally) when RE fails for extended periods of time (see German RE production records in winter). Are you with me to this point? If not, why not? If so, then here’s the crux: Once you build nuclear capacity to that level, there’s no point in having RE systems. They just become expensive redundancies that add instability to the grid. The cost of nuclear fuel is trivial, and nuclear plants are just fine running at full power 24/7/365, with zero emissions, on a footprint that’s microscopic compared to RE land requirements. And since peak demand is 2-3 times average demand (depending on the industrial profile of the area served), if you’ve got enough nuclear to cover peak demand (which you need, as I said, to cover when RE produces nothing, which sometimes happens for a week or more at a time, as evidenced by German production data), then you’ll have 100-200% of your electrical demand in excess power. With that you can use it for all sorts of ancillary uses, as we discussed above. RE without nuclear as backup requires a Faustian bargain to keep using fossil fuels. RE with nuclear as backup makes RE unnecessary. Nuclear power can easily produce all the power that humanity desires. Once the newer non-pressurized advanced reactor designs are demonstrated as both safe and economical, the inescapable logic will be obvious. Maybe not to ideologues, but it will certainly be obvious to utility companies and other business entities that will make the decisions about how to power modern societies. Tom: Thanks for your reply. While I agree that nuclear is low-carbon and that’s where we need to go, I don’t agree with your assessment that storage is the only way to go to make RE work. Demand response will go a long way there as will high-capacity interconnects. Then there are dispatchable renewables (solar thermal, for example) and other ways to make “intermittent” energy work. Also, utility-scale storage is not a “pipe dream” as it now exists in South Australia. Also note that “baseload” is not a thing. Power plants go offline for maintenance and other reasons so the energy system must be robust. Nuclear is certainly “less intermittent” than RE. So far, nuclear has been too expensive to compete and requires subsidies to exist (waving of liability for example). I would love to see small, low cost, inherently safe SMRs come online. In the meantime, we need to roll out RE as fast as possible. Emissions are cumulative so time is of the essence. You may want to re-examine the “too cheap to meter” fiasco so that proponents of renewable energy don’t fall into the same trap. When you say we are rapidly heading to $0.02/kwh , it is a strong argument to end all renewable energy subsidies. Should individual States that have renewable energy mandates, like New York’s 50% renewable electricity by 2030, drop these mandates because of such low projected renewable energy prices? It would seem that market forces will produce high renewable energy penetration, much like low cost natural gas has eaten into coal based electricity ( and nuclear) without any mandates, but largely on the basis of low costs. Are you suggesting that it is time to end subsidies and mandates for renewable energy? Did your $0.02/kwh include subsidies and, if so, how much? A little bit of history might be useful. Former New York Governor George Pataki in 2003 called for New York to have 25% of its electricity generated by renewables in 10 years (2013). In 2016 all the solar electricity in the State would only supply a bit over 3 hours of the state’s demand. In 2016, wind + solar only produced around 4-5% of the State’s electricity in spite of NY’s large REV program. So this $0.02/kwh figure you reference… is this for isolated areas, or is supposed to be a national average? Mandates have their place, but we still live on a planet that obeys the laws of physics and thermodynamics. I suspect that many well intended mandates will not be met because they are politically based, with limited scientific support. As you imply, storage is a critical aspect for expanded growth of renewable energy. Many think of lithium-ion batteries when they think storage. There isn’t that much lithium. I urge people to read “World Lithium Supply” by Eric Eason ( November 30, 2010). To quote Eason ” This suggests to me that if all the world’s cars are going to be made electric, it is likely that a mixture of battery technologies will be used. It is certainly possible to build millions of electric vehicles with lithium-ion batteries, but it may not be possible to make billions of them.” What are the battery costs for non-lithium battery designs? How would such non-lithium battery designs affect projected renewable energy costs? For nuclear power, energy storage is already in the fuel at very high energy densities. We spend a lot of time talking about risks and consequences. The risks from fossil fuels and from nuclear power are associated with the production of energy,e.g. air pollution, climate change, land contamination, etc. The risks from producing energy from renewable energy sources are quite different and very small, even if you consider consequences like bird kills from solar power towers and wind turbines. The dominant risk from renewable energy is a result of insufficient energy production. There are many examples of this from the consequences of low hydro power production during droughts to people denuding whole areas when their local supply of wood is insufficient ( This has led to deadly mud slides when forests on sides of mountains were stripped of their trees because local wood supplies could not keep up with growing demands for energy). After World War I the normal supply of coal to Vienna, Austria was in very short supply and people were freezing to death. So the Viennese cut down their beloved Vienna Woods. I have a picture of these woods just after this happened. What a sad spectacle. Insufficient energy can be just as destructive as the by-products of producing energy. So renewable energy has its own forms of risks and consequences because of insufficiency, and therefore all of us must be cautious about over-stating its contributions. I say this fully aware of all the old arguments about the huge amount of energy the world receives from the sun each day, the great power of the tides, etc. I remind people about the plight of many people who live on islands and face continual water shortages. Even though they are surrounded by an “infinite” amount of water, unfortunately for them, it is saline and requires some means to make it drinkable. The challenge has never been the infinite supply of renewable energy, but how to get it in a form suitable for human consumption. Renewable energy is not better than nuclear energy and nuclear energy is not better than renewable energy. They are merely two non-carbon sources of energy in a world desperate for energy, and, at present, highly dependent on fossil fuels. Not only are the majority of energy sources fossil fueled, the vast majority of end use systems: transportation, space heating, hot water heating, industry, agriculture are dependent on these fossil fueled sources. In my opinion, people who argue that one non-carbon source of energy is better than another non-carbon source do not fully understand the magnitude of the challenge we have in achieving a low-carbon future. 1. $0.02/kWh is already being approached in some parts of the world. US prices are higher for a variety of reasons, but the trend is still down. 2. No, subsidies for renewables should not be removed. The subsidies for fossil fuels are enormous. Fossil fuels are the most expensive thing you can use for energy when all costs are included, so we should put a carbon tax in place to help make renewables more cost-effective on a direct payment basis. In the meantime, subsidies should stay in place. 3. The risks from fossil fuels and renewables are very different. The negative impacts from using fossil fuels last literally for thousands of years. The risks from an energy shortage are transient. You can fix the later, you can’t fix the former. 4. There is a large supply of lithium in the oceans. It is dilute but people are working on how to extract it cost-effectively. Other battery technologies are available (like the Silicon Joule technology from our portfolio company, Gridtential). 5. I agree that nuclear is a low carbon source of energy. The question is when can it be brought online, at what cost, and will the public and policymakers support it? As reported by the UN, the world is failing to meet GHG reduction goals to prevent the severe effects of climate change . There are a number of reasons for this that go beyond some groups being deniers of man-made climate change. Even those who are very concerned about climate change have not yet come to grips with some basic facts. First, most of the GHG released in developed countries does not come from the fossil fueled power plants, but rather comes from the end use functions of transportation, industry, agriculture , residential and commercial sectors. As a case in point, New York State, which has essentially eliminated coal from electricity production, now has 82% of its GHG releases coming from the end use sectors. While it is essential to have clean electricity, achieving this alone is far from sufficient. Replacing the use of fossil fuels in end use systems is an enormous task s this would require billions of replacements. Further, much greater use of electricity will be needed to energize these non-fossil replacements. I’ve estimated that in NY State alone a GHG free future would require about twice the carbon-free electricity production than what the whole State produces today. Once this huge replacement and new non-carbon sources challenge is appreciated, several current energy myths disappear. First, the fact that electricity growth is slow today, or even shrinking, is actually an indicator of a very short term situation, if one truly seeks a low carbon future. Second, the need for electricity is so large that we will need all sources of carbon-free electricity. It is not a matter of renewable versus nuclear or centralized versus decentralized sources, as extremists like to suggest, but rather a question of can enough renewable + nuclear be brought on line soon enough? That said, I believe that there is need for both large nuclear plants and SMRs. Both are extremely safe. SMRs have one advantage that is not often recognized. They are an ideal distributed electricity source. With both extreme weather from climate change and from possible cyber attacks, having distributed electricity sources, both nuclear and renewable, is a major security benefit. As to discounting the need for nuclear power because many hold irrational fears, that, to me, is an abdication of responsibility. People who know better are obliged to speak out. The irrational fear of nuclear power is slowly giving way to the very rational fear of the effects of climate change. But the clock is ticking. Another perspective: Even though Small Modular Reactors (SMRs) may be more expensive to operate than existing light water reactors, this new class of technology may add a resilience benefit that is missing from the more than 90 NRC-licensed commercial reactors operating at more than 60 facilities in the United States. Under existing Nuclear Regulatory Commission safety standards, if there is no access to off-site commercial power from the bulk power system subject to Federal Energy Commission regulation, the nuclear power plant must shut down and remain shut down until off-site power is again available. The NRC acronym for this condition is “ELAP”: extended loss of (offsite) AC power. For a nuclear plant with recent reliability issues, such as the Pilgrim facility in Massachusetts, it is necessary to shut down in the absence of two independent sources of commercial power supply. This shutdown condition occurred during the recent severe weather of January 2018. In contrast, a facility with multiple SMRs may be authorized to “blackstart” the other SMRs on site, even in the absence of operability of the electric grid within the pertinent NERC Balancing Authority or Reliability Council region. The NRC has recently indicated that off-site electric power may not be required for SMR reactors that can restart the other operational SMRs within a licensed facility. So the SMRs need not shut down when commercial grid power is otherwise unavailable. A network of SMR facilities could be designed to “blackstart” other generation facilities, including fossil fuel generation within the North American electric grid. When considering mission-critical Tier 1 Defense facilities or requirements of Tier 1 Data Centers for reliable electric power, the extra costs of power derived from clusters of Small Modular Reactors may be worth the extra cost of more resilience electricity supply. And if economies of scale can be attained, SMRs may over time become cost-competitive with those light water reactors that remain in service. Major customers of electric power seeking electric service that can withstand “all hazards” may need to insist upon design of Small Modular Reactors that can withstand the E1 pulses of high altitude EMP and the slower E3 pulses from either high altitude EMP or severe solar storms. There are various contingencies that place at risk of prolonged electric blackouts large regions or even the entire continental United States: cyberattack on critical infrastructures; a severe solar geomagnetic disturbance impacting the Northern hemisphere; a cluster of high altitude electromagnetic pulse (HEMP) attacks; or a combined arms cyber & EMP attack. The potential capability of clusters of small modular reactors to “blackstart” each other — the SMRs within a facility –plus to recover operability of other regional electric generation and transmission systems may add elements of resilience otherwise lacking in the North American electric grid. Under prompting from Secretary of Energy Perry (Sep. 28, 2017), the Federal Energy Regulatory Commission has embarked on an exploration of resilience pricing for electric generation that has favorable resilience attributes. The ability of SMRs to capture “resilience pricing” benefits may be an essential element of the successful commercialization of SMRs in the U.S. electric grid. The need to commit to safe storage and disposal of nuclear wastes remains a challenge. Fast reactors can extract some of the remaining energy in fuel assemblies, and shorten the period of hazard for nuclear spent fuel storage. Bill Harris, former Senior (Legal) Advisor to the Congressionally-mandated EMP Commission (2017), and Secretary, Foundation for Resilient Societies, Inc. (2012 to present).